Giving artists space & time to create work that makes your head hurt – in a good way. Do you anticipate your recent moved back to Kalamazoo, after 10+ years living and working in Syracuse, NY, impacting your work and/or practice? First, to clarify, I left Kalamazoo fourteen years ago and have lived in four other states since then, most recently New York. When I made the decision to return to Kalamazoo, I realized with excitement how significant the city is to my work because it's where many of my interests found their initial expression: I fell in love with photography as a student at WMU, worked with blind students on campus as a text book reader through the Michigan Commission for the Blind, and first discovered stereographs and stereoscopes (early 3-D photographs and their viewing devices, respectively) while browsing through the Kalamazoo Antiques Market. Subsequently, each of the cities I've lived in has played a role in further developing one or another of these aspects. For instance, in Seattle I worked extensively with blind and low vision adults while in Syracuse I became an inventor with an updated stereoscope, the TwinScope Viewer. Now that I've been back in Kalamazoo a month, I'm noticing how these individual threads are coming together at Makeshift into a broad consideration of the act of observation and the enormous possibilities of visual perception. My initial passion for photography that defined my years in Kalamazoo is announcing itself too, although I'm highlighting the non-technical photographic acts—abstracting, selecting, and framing—and also attempting to make images that go beyond documentation to somehow refer back to photographic seeing, to highlight the cognitive mechanisms of perception, or to create illusory effects. Additionally, over the last few years I've been making installations and interactive works and beginning to think about other sense faculties like touch and hearing. At Makeshift I'm treating the gallery itself as something of an installation inasmuch as I'm very concerned with what the viewer experiences as he or she enters the space and travels through to the far back windows. The visual presentation of works is designed with vantage points in mind and has a trajectory, and I'm also quite interested in bringing the source material inside by way of actual street sounds and outdoor air. So we'll see what the future holds but at this point it seems that returning to Kalamazoo brings an integration of related but previously demarcated sensibilities. Hopefully this dispersion won't dilute the work, but I'm willing to take that risk to see where it leads me. FOLLOW-UP: It’s good to hear that you feel you’re taking certain artistic risks – something we encourage at Makeshift. It’s also been our goal to demystify the studio process, which is sometimes perceived as linear and self-assured. What do you define as a risk in your practice and how have you personally dealt with any resulting uncertainties? By design or circumstance, the Makeshift residency is a risky venture from the start. 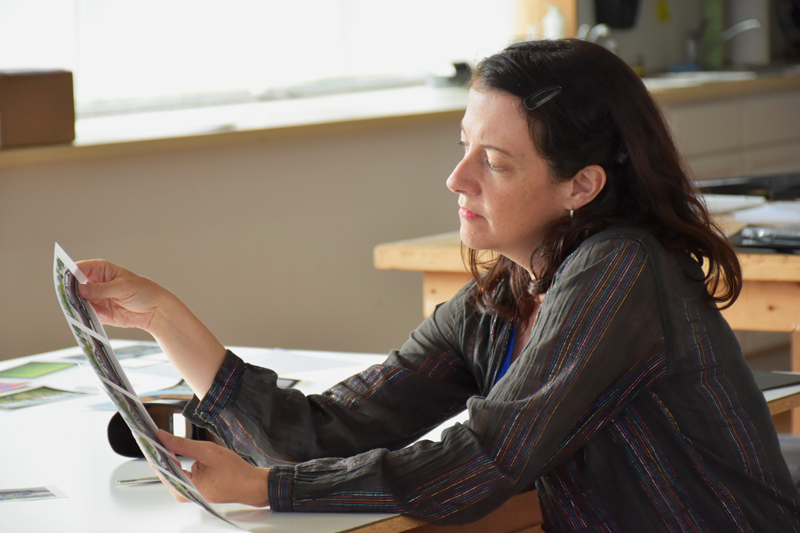 Many artist residencies provide a private studio with no expectation to share process or results with the public. Makeshift is different. Half gallery and half studio, with just a partial wall to separate the spaces, Makeshift gallery visitors can pop into the studio and thereby glimpse the resident artist’s process as well as judge their progress. And progress is important because at Makeshift the residency concludes with a solo exhibition and public reception. Process is on the table (literally) and the deadline is this ever-approaching thing that’s both motivating and anxiety-producing. Thus coming to Makeshift itself was a risk given the pressure of a solo show, the short time frame for making new work, and the somewhat open studio concept. Any artist in that situation would be tempted to rehash successful works, yet I didn’t want to do that. Plus I felt that this would be my coming-out as an artist returning to Kalamazoo after many years and would represent my current practice. So, no pressure! Risky means throwing the clock against the wall, walking into darkness, ignoring the watchful eyes. My goals for the residency were to experiment (to learn at least three new things), to make work that I’d want to further develop after the residency, and to create a cohesive exhibition that was fully-realized for the specific site. I think I did it, but the path was not linear, nor self-assured. Rather, I came in with preconceived ideas for entirely different exhibitions and tossed them out by the third week. Then I played, got lost, napped, had moments where I thought the work was insipid or boring, and other moments where sparks ignited and I was ecstatic. I thought about the exhibition constantly whether at the studio or at home, and often in the middle of the night. I overcame uncertainties by accepting they were there, moving forward, and then trusting my instincts. The scariest part of the residency, and the most important personal take-away, was really understanding that when I’m given a gallery to fill, I try to create a total experience for the viewer. Therefore I need to be on-site, actually in the gallery as I’m shaping it. At Makeshift the gallery was occupied with other artists’ work until a week before my opening. So I had to use my imagination for most of the residency, and then work very quickly that last week installing the show in order to account for any surprises. As nerve-racking as it was, that last week was my favorite time at Makeshift: risky and exciting and terribly rewarding. Your work has a dedicated interest in traditional stereoscopic processes. Emerging technologies such as Oculus Rift, or even Google Cardboard, enable users to have similar, albeit very different, experiences. Are you familiar with these devices – if so, do you think there is a common human experience despite the technological divide? Yes, I'm familiar with Oculus Rift and Google Cardboard. When I give presentations on my TwinScope project (the TwinScope Viewer and the stereograph exhibitions and events that I've produced), I describe how stereographs and stereoscopes are the genesis of virtual and augmented reality, which these new devices bring to the public. There has always been an impulse to represent what French film historian Laurent Mannoni calls “the feeling of life.” Photography was an unbelievable achievement when it was first announced: imagine, capturing someone's actual likeness as if they are right before you! Yet photographs render life as a flat, two dimensional image from one vantage point. The principles of stereoscopy were understood before photography was invented and had been demonstrated with two side-by-side drawings that could be fused into one three dimensional image when seen through a stereoscope. Photography was immediately applied to making stereographs, and viewing these little three-dimensional photographs became the most popular amusement from about 1850-1930. Then the beloved View-Master was invented in the 1940s, and today there is a huge community of stereoscopic photographers using digital tools. As for adding motion to stereoscopic imagery, that goes back to the earliest days of motion picture inventions; W.K.L. Dickson, while working on his motion picture camera and projector for Edison in the 1890s, describes how incredible it is to watch a series of quickly-taken motion photographs come alive as motion pictures, yet how much better it is stereoscopically! So we're just at the next chapter with virtual reality, and augmented reality is the future. It's no longer enough to simply enter the scene, as viewing stereo photographs accomplishes so well, but we want to move about freely inside a simulated environment and control the action there too. Personally I'm a little nervous about these developments. There's a huge, real world to explore and that's about all I want to manage. FOLLOW-UP: From the perspective of this new chapter, what ideas do you hope to introduce or reinforce with your use of traditional stereography? My motivations are both on the surface and nuanced. Primarily, I want to stress that what seems new is really quite old. I share the history of stereography to underscore the fact that our human fascination with simulacrum in this form is deep-rooted. From that perspective we can ask why we crave such experiences, and then ponder tangential ideas such as the uncanny, the mechanisms we use to escape reality, and our sense of control or helplessness over our lives. I know that sounds abstract, but especially with augmented reality I’m inclined to this line of thinking. Stereographs interest me for so many reasons outside of their relationship to emerging technologies: because they illustrate binocular vision, because they’re little rebels that can’t be pinned down (at once photographs, objects, media vehicles, ephemera and fine art), because their diminutive size belies the vastness they offer, because viewing them through the stereoscope increases alpha brain waves and brings relaxation…I could go on and on. Visual impairment has been an ongoing focus of your work. Has your investigation into this field led to lasting relationships with visually impaired individuals and/or communities? I'd like to share a story first. When my identical twin sister Rani and I were eleven years old, we put on our red-blue paper glasses to watch the much-anticipated televised 3-D movie “The Return of the Creature from the Black Lagoon.” When the creature lunged off the screen, I recoiled, but my sister didn't move. That's when we discovered that she lacked binocular vision, or the ability to see in depth due to a visual impairment called strabismus. I was stunned to think we had such radically different impressions of the world, and for the first time, I wanted to see out from another's eyes. In her late twenties, Rani learned about vision therapy and started a four-year program. Wearing that eye patch, doing the exercises—it was hard, and painful. The first time she saw in 3-D, the tree branches appeared as if coming toward her in space and the sidewalk receded into the distance. It was incredible, and then she wanted to throw up because of the terrifying change. Rani's story is close to my heart (I made the TwinScope Viewer with her in mind) and motivated me to learn more about the inconsistencies of sight. In Seattle, I went to an art exhibit of work by members of a tactile art class for blind and low vision adults. One of the artists invited me to attend the class, and I felt so welcome that I kept going every month for a year, made close friends with four people in particular, and finally worked with them outside of class on the material that became my Persistence of Vision project. It's been over two years now, and I'm not great at keeping in touch with friends but I still exchange emails with a couple people and follow the activities of the group. More recently in Syracuse, I befriended author Stephen Kuuisisto and named an artwork after his wonderful memoir (and blog by the same name), Planet of the Blind. You refer to the “ethics of looking” as a subtext in your work. Can you expand on what this term means to you specifically? As an identical twin, I grew up a spectacle and endured public staring a lot. Yet observation is also a favorite pastime of mine, so I grapple with the question of when the poetic action of watching becomes surveillance, which suggests malicious intent. A few years ago I read a book by John Stilgoe called Outside Lies Magic in which he discusses the idea that before the automobile and TV, people used to walk around their community and enjoy simply looking at their surroundings. Now we race from one place to the next and are glued to our screens, sadly discounting the pleasure and knowledge that observation brings. Stilgoe is right, but if one is seen gazing at length on something, that person become suspicious. Also, as a photographer, people would sometimes jokingly call me paparazzi which I felt offended by. Yet maybe it's true: I've hidden behind the lens as if behind a bush, and I grab shots without asking permission. This slippery question of the “ethics of looking” creates a tension I enjoy and sometimes exploit in my work. FOLLOW-UP: I’m reminded of a recent series called ‘Neighbors’ where artist Arne Svenson photographed his unsuspecting New York neighbors through their apartment windows with a telephoto lens. The resulting controversy centers on freedom of speech as well as an individual’s rights in public vs. private spaces. Are there specific examples in your own work that approach this fairly nebulous distinction? The issue is something that was first brought to my attention years ago when I was a working photographer and member of the American Society of Media Photographers (ASMP). The right to photograph someone without his or her permission depended on where that person was standing: if on public property, they were fair game, but not on private property. We also had to consider usage (how the photograph was used): editorial use did not require a model release, commercial use did. Concerning the display of these photos in a fine art context, it was a gray area. Then 9/11 happened and photographers were viewed with a lot more suspicion, making it harder to photograph in public. Social media really changed the game, however, and now all carry an awareness that to be photographed means to be put on public display. I cringe when I realize I’m being photographed because I don’t know how I’ll be depicted. It’s unsettling, and so I approach photographing others with delicacy. If they’re recognizable or the image will be shared, I hope to positively surprise them (“well, aren’t I fetching after all?”). That said, sometimes a person is simply part of a larger scene or the image is not about them so respecting the ego seems less important. A handful of images in Kalamazoo & Park depict people in passing cars or walking down the street. I sprinkled these in, wishing to touch on privacy rights and surveillance while not letting that become an overriding theme. But since I’m answering these follow-up questions so late, I can bring up a perplexing incident that happened at the opening reception while talking to someone who was viewing Brown Sedan, Kalamazoo Ave. To make the image, I stood on the sidewalk facing the street and pointed my camera at passing traffic. Doing so, I was obvious to the drivers but I knew none would stop to ask why I was taking pictures. So I ignored my nagging sense of shame, focused my camera on the traffic lane, and fired the motor drive as cars whizzed by. 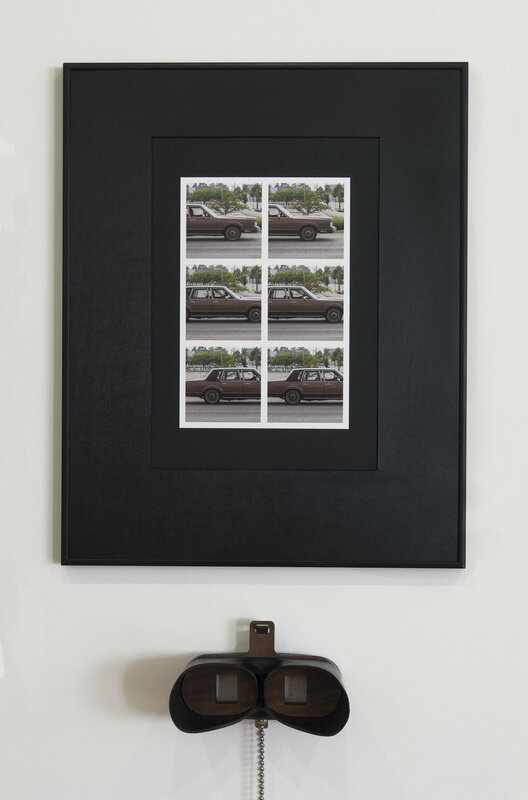 I didn’t take many images but, happily, that brown sedan was among the passing vehicles and the images wondrously conformed to my idea for a stereoscopic image. Looking through the stereoscope at the 3D photographs heightens the voyeuristic implications of the work, and yet the man behind the wheel is anonymous to me. So I was surprised when someone said “I know that guy, he’s my neighbor.” She told me that he was going through some rough times, and then I suggested she take a picture of the work and show him. I thought maybe it would be a bright spot in his day, and I was really excited at the thought of his excited reaction (after all, this was no ordinary image but a 3D photo of him in his awesome vehicle, suspended in time and space). Then I realized how shocking it might be, how upsetting, to realize that when you thought you were just going about your day, you were actually being watched, an image of you was being captured, and now your likeness is on a gallery wall for a bunch of strangers to examine. Yes, it would likely upset this man, perhaps make him wonder if he’s being watched now. Worse case, he’d become paranoid, and he was already having rough times. I just couldn’t risk his becoming unhinged because of my art project. Selfishly, I also didn’t want to risk his reproach. So I became adamant that we should definitely not let the man know about this. And now reader, I must politely ask that if you know him, mums the word. And if on the off-chance you just happen to be him, I sincerely hope you like the work and are ok with your unwitting collaboration. Contact me and I’ll gladly make you a copy. Last year I came across a great quote by British artist David Hockney that I've put high on my playlist: “Photography is all right if you don't mind experiencing the world from the perspective of a paralyzed cyclops, for a split second.” I also think about Robert Irwin's statement that being an artist is not about making objects but rather about the state of our perceptions. In terms of work itself, I've rediscovered Ray Metzker's photography. He was radical for making images that explored new ways of seeing, and I appreciate how he took the raw materials in front of him (subject matter, lighting) and used framing to create evocative, mysterious images with tangible energy. Posted on August 21, 2016 by Staci Gibson and filed under Q & A and tagged Colleen Woolpert. The Kalamazoo Collective Arts Center / The Irving S. Gilmore Foundation / The Kalamazoo Artistic Development Initiative through the Arts Council of Greater Kalamazoo / The Michigan Council for Arts and Cultural Affairs Minigrant Program, administered by The Arts Council of Greater Kalamazoo. All work displayed on our website is copyrighted © 2016 by Makeshift Inc. and our represented artists.